One of the world’s most scenic golf courses, the Fairmont Banff Springs Golf Course spreads out along the Bow River between Mount Rundle and Tunnel Mountain. The first course was laid out here in 1911, but in 1928 Stanley Thompson was brought in by the CPR to build what was at the time North America’s most expensive course. In 1989, the Tunnel Nine opened (along with a new clubhouse), creating today’s 27-hole course. Fully restored, the course is typically Thompson, taking advantage of natural contours and featuring elevated tees, wide fairways, treacherous fescue grass rough, and holes aligned to distant mountains. From the back markers it is 7,087 yards and plays to a par of 71. The course is not only breathtakingly beautiful, but it’s also challenging for every level of golfer. Pick up a copy of the book The World’s Greatest Golf Holes, and you’ll see a picture of the fourth hole on the Rundle 9. 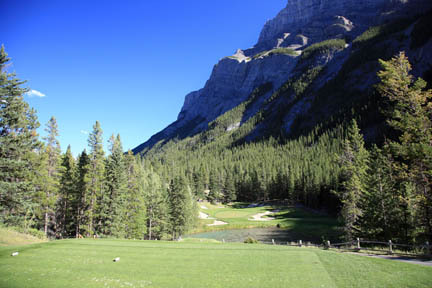 It’s a par three, over Devil’s Cauldron 70 meters (230 feet) below, to a small green backed by the sheer face of Mount Rundle rising vertically more than 1,000 meters (3,280 feet) above the putting surface. Another unique feature of the course is the abundance of wildlife: There’s always the chance of seeing elk feeding on the fairways, or coyotes, deer, or bears scurrying across. Greens fees (including cart and driving range privileges) are $225, discounted to $135 in May and late September to early October. The Tunnel 9 offers the same spectacular challenges as Thompson’s original layout but lacks the history; nine holes cost $80. Free shuttle buses run from the Fairmont Banff Springs to the clubhouse. (The original 1911 clubhouse still stands, but it has been replaced by a modern, circular building in the heart of the course.) There you’ll find club rentals ($50 to 65), putting greens, a driving range, a pro shop, two chipping greens (one hidden up in the trees with surrounding bunkers), and a restaurant with a stunning wraparound deck. Booking tee times well in advance is essential; call 403/762-2211.